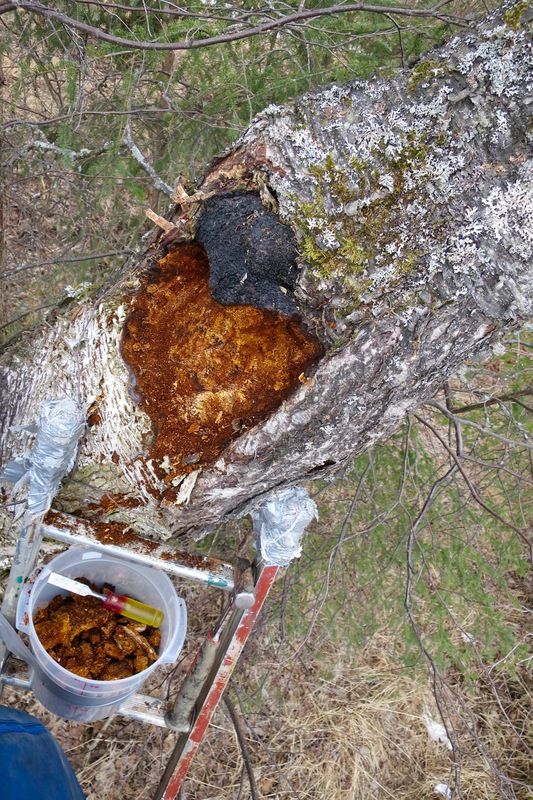 Woodsen and I first heard of Chaga via an article in our local newspaper the Alaska Dispatch. 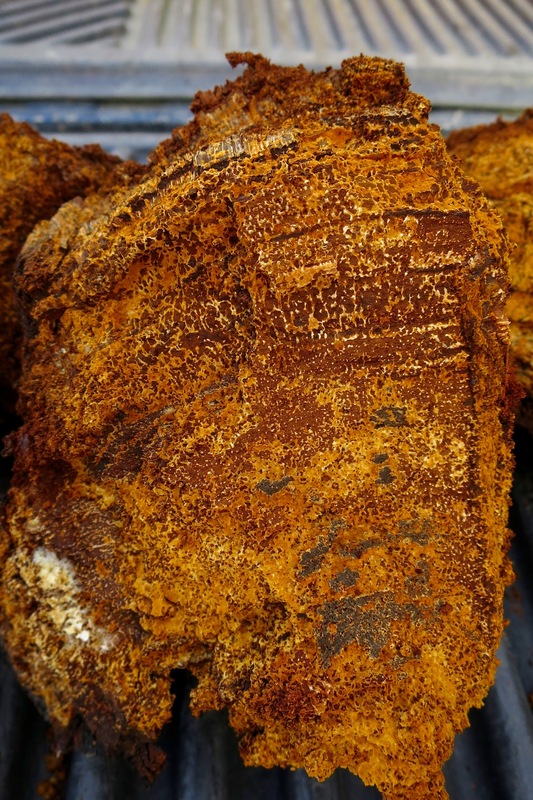 The article described all the health benefits, where you could buy a “chagalatte” here in town, and talked about the potential chaga market in Alaska (read the article here). All this was great but the realization that really grabbed me was that we had tons of birch trees on our property that we had never even looked twice at, many of which probably had valuable chaga just sitting there waiting for us to harvest. I am a treasure hunter at heart and love anything that involves searching for something. It could be beach glass, fishing, digging for potatoes or geocaching. I generally care a lot less about what I’m getting and more about the adventure of finding it. 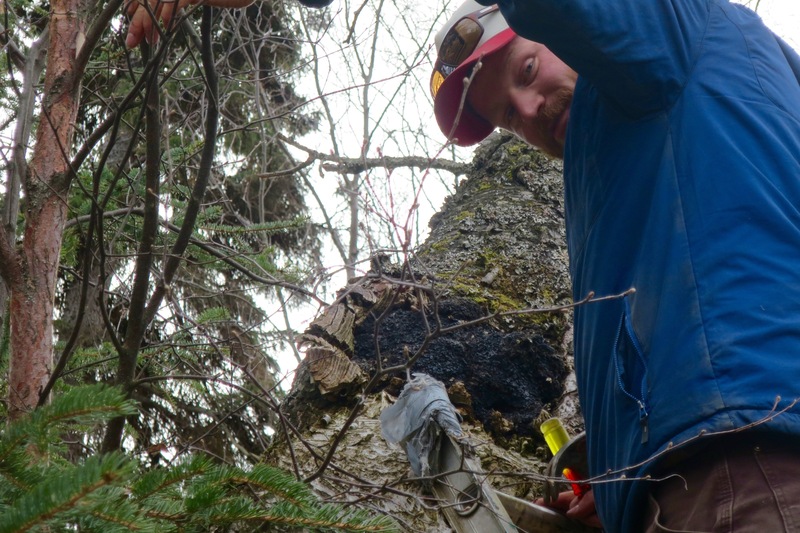 That night we broke out our headlamps, chisels, and hammers and began hunting for chaga. We searched our 2.5 acres with little luck and my excitement quickly flatlined. Right before heading in we found a chaga the size of a tiny orange right outside our door. Moral soared and we immediately looked up instructions to make tea. We found this character on youtube and we were quickly sipping on our first batch chaga tea. 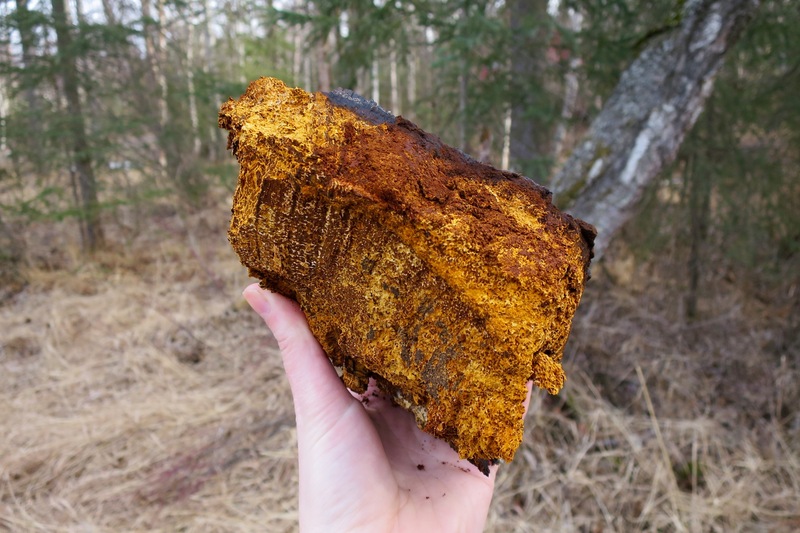 Chaga tea isn’t delicious. It doesn’t taste bad, but it mostly tasted like the honey my husband had poured in. I have to say it was better than I expected considering we were drinking a fungus that was on a tree outside our house 10 min ago. Skip forward about a month (past hikes where I couldn’t help eyeing every birch tree along the trail) to yesterday when Woodsen came home and suggested we take a walk down the road to check out a suspicious burnt looking area on a birch tree he had eyed while driving home. 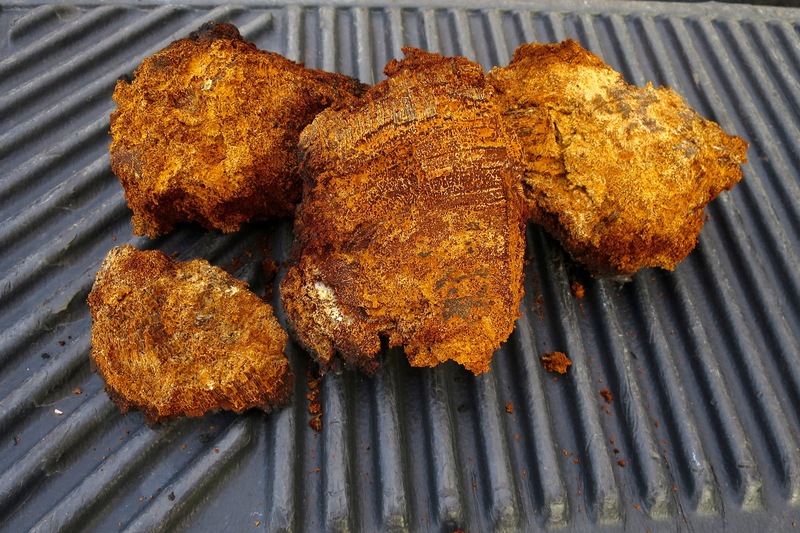 Sure enough, right by the road we found this mammoth chaga. We decided to be good neighbors and ask permission before we started attacking their tree. Recently some of our close friends had classified us as hippies, much to our indignation and denial. They reassured us saying “its ok you just have hippie indigestion right now, you’ll get over it”. I’m not sure if it was while we were asking our neighbor if we could harvest a fungus off his tree, while our other neighbors drove past us hacking away at the tree, or when I told my friend what we were doing and she laughed and called us hippies, but somewhere in there we couldn’t help laughing at ourselves and the realization that yes, in fact, we probably were hippies. Or at least what we were doing was very hippi-esk. 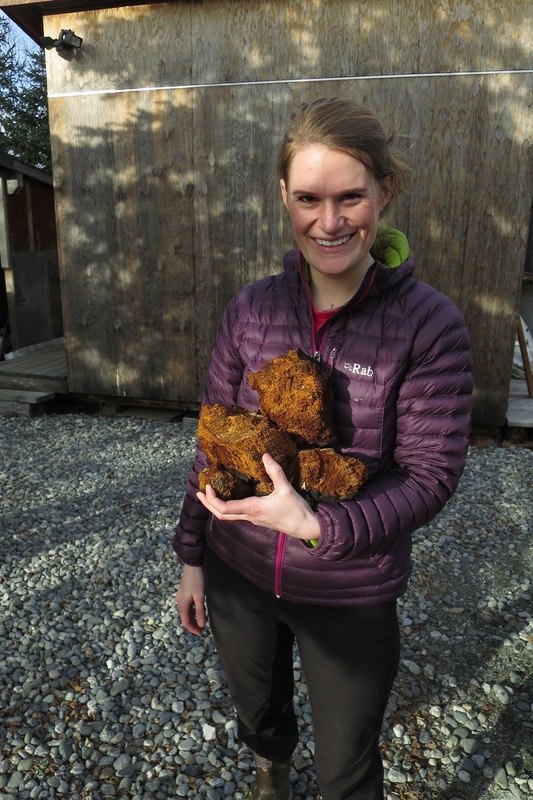 Here it is in all its amber glory… Chaga chunks, and one very happy treasure hunter. I’m a big chaga fan as well, Danica. We harvest it around our cabin, it’s all over the area. I use one of those old food dehydrators to dry it after I’ve broken it up.